"KC" can not be assigned to a declared number type with value 91. KC091 R2-D2 Key Chain a Star Wars key chain released in 2006. 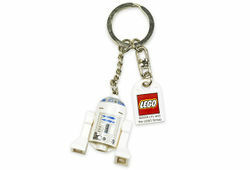 The set includes R2-D2 and a LEGO logo keychains. The set includes one minifigure, R2-D2, on a keychain. A second keychain extends of the keyring with a LEGO logo on it. This is based off the original variant of R2-D2. Facts about "KC091 R2-D2 Key Chain"
This page was last edited on 9 January 2016, at 23:42.